The first Washington team to qualify for the Special Olympics USA Games in unified softball came up short of a gold medal, but had a wonderful experience. If all you were paying attention to was the final score, you were kind of missing the point. For the record, the Kitsap BearKats, the first unified softball team from Washington to qualify for the Special Olympics USA Games, lost 14-5 to Florida in the gold medal game in their three-team division Thursday afternoon at Celebration Park in Federal Way. But the game was so much more than just the final score. There was Travis Schultz jumping up and down, screaming at his son, Austin, to “use your wheels” as he finished off an inside-the-park home run for Team Washington. Then, a couple innings later, father and son were celebrating again as Austin hit another inside-the-park home run. There was the wife of one player who never stopped yelling encouragement, no matter how dire it looked on the scoreboard, and was so loud she scared a baby sitting in front of her. And then there was the big ovation for Washington pitcher Bill Nelson when he was replaced on the mound after being unable to throw strikes. Nary a negative word was heard as he threw ball after ball, only words of encouragement. Coach Barb Pool started the Bremerton Kitsap Athletic Teams (BearKats) for Special Olympics in 2006. Most of the players on the unified team have been playing for several years, including Duncan, whose mother teaches special education. Chris’ brother Jordan, who also played baseball for Olympic, is on the team. In unified softball, there are five athletes (Special Olympians) and five unified players (with no disability) on the field. They alternate in the team’s batting order. For Pool, becoming the first team from Washington to compete in the USA Games was a huge highlight. The athletes excelled Thursday. Andrew Bumanglag made a great catch in deep left-center field with the bases loaded and two outs, saving at least three runs. Then there was Austin Schultz, who noticed the outfielders were playing shallow when he came up to bat in the bottom of the third inning. He smashed the ball over their heads in left-center and never quit running until he scored to cut Florida’s lead to 5-3. “I just wanted to run around four bases and score for our team,” Schultz said. Dad, after jumping up and down, ran toward the dugout to greet his son. Who was more happy, Travis or Austin? Both agreed it was Dad. Then, two innings later, Schultz showed his speed again, lacing a long fly to left that was just inside the foul line, and went all the way to the fence. Once again, he wasn’t stopping. “On the second one I got lucky a little bit … it went right by the foul line, and I was going to hustle and try to score another point for our team again,” he said. It’s that kind of moment that makes it so much fun for Chris Duncan. After the game, he got the team together. His message was all positive. In the end, Team Washington was unable to overcome an avalanche of walks it allowed, but that didn’t dampen Pool’s mood one bit. “We wanted to represent our state, we are bringing back hardware (a silver medal) and we couldn’t be happier,” she said. 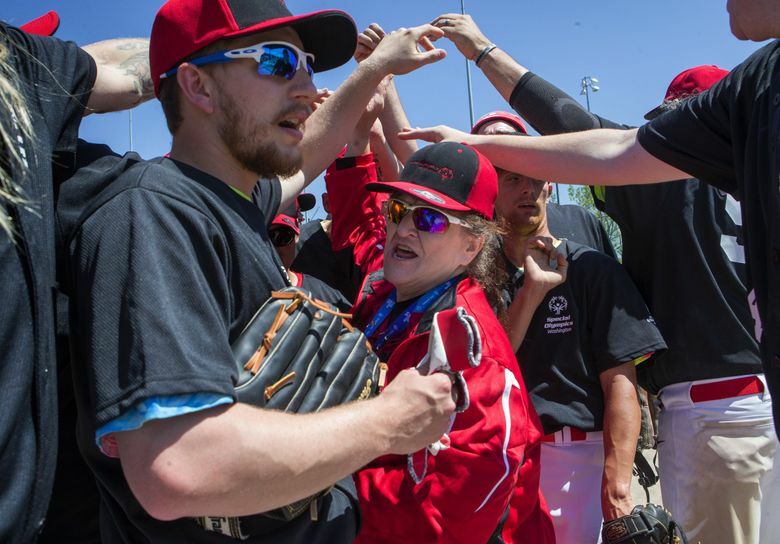 The matchups might not have been ideal for Team Washington in traditional softball at the Special Olympics USA Games, but the players left happy if without a medal. Team Washington lost 13-5 to Maryland in the bronze medal game in its division Thursday afternoon at Celebration Park in Federal Way, another tough game for the local team coached by Patty Studdard. Studdard said what she will take away from the event is the joy on her players’ faces when they were competing. She said getting a chance to play teams from other states served a bigger purpose than just competition. Five teams won gold medals in softball Thursday. Florida, Oklahoma and Arkansas won unified divisions, and South Dakota and Ohio won traditional divisions.